ACTUAL BRIGHT LIGHT - 2 CREE LEDs - 3 Watts - Up to 300 Lumens of bright light. Lights up your garden, driveway, patio, entrance, or anywhere you need light after dark. 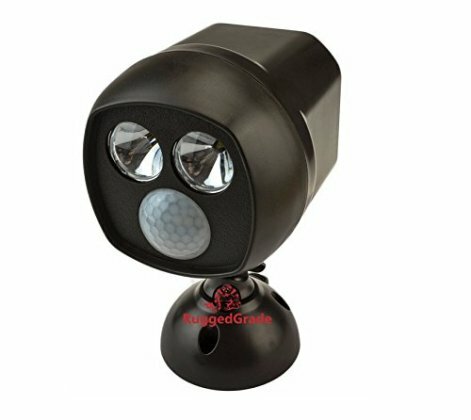 Light up the areas around your house, garden or office with our motion spot light from RuggedGrade. No wiring required! Up to 450 Lumens when motion is detected, providing a nice bright security light. RuggedGrade was formed to bring higher quality LED lighting to the public. There is so much great new technology in LEDs, but unfortunately there is so much confusion and poor quality products in the marketplace. We have found that customers are unsure and sometimes skeptical of LEDs, we all have bad memories of the early versions. Rugged Grade is committed to changing that perception. We are bringing only the best quality LED products to market and backing them with satisfaction guarantees and strong warranties. Check out our wide selection of Solar LED lights, Motion Solar Lights, High Bay LED lights, Spot LED Lights, Flood LED Lights, Corn LED bulbs, Street Lights, Warehouse Lights, Retail and more.